Find out how to update your profile on the new department website! The new English department website looks terrific, but it would look even better with complete graduate student profiles that include professional photos and information on individual research, teaching, and other projects. 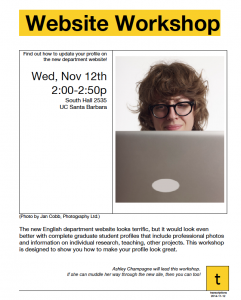 This workshop is designed to show you how to make your profile look great. Ashley Champagne will lead this workshop. If she can muddle her way through the new site, then you can too!